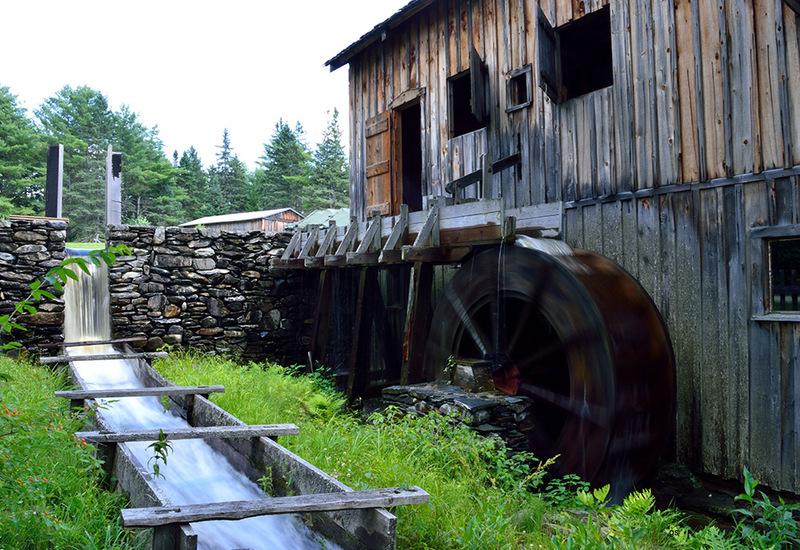 Water is what makes the mill wheel go round! This picture demonstrates what happens when too much water is in the mill pond. The water level in the pond is regulated by an overflow, shown here to be open. The mission of the Maine Forest and Logging Museum is to preserve, celebrate and educate people about the sustainable forest culture of Maine. The MFLM is a nonprofit organization incorporated in 1960, and is unique within the State in its focus on forest resources in a cultural context. We have many events that focus on the forest and our goal is to embrace all the the forest is and has been! We believe that everyone has a way that they can actively engage with the forest, and to support that, we have regular programming to help people find ‘their place in the woods’. Our larger events often combine an interactive Living History format with an operating “up-and-down” sawmill, and a variety of other interpretative sites that include an authentic blacksmith shop, bateaux, trappers’ line camp, covered bridge, and a settlers’ log cabin. With school tours and public programs at Leonard’s Mills, the Museum provides to residents of the state and visitors an educational and enjoyable experience through living history. The buildings, collections, research, and – most importantly – the educational and public programs of the Museum are the accomplishments of hundreds of volunteers from throughout the State (drawing from the entire Maine Highlands region, and from points as far as Fryeburg, Millinocket, and Houlton). In the mid 1950’s a group of enthusiastic volunteers, mostly associated with forestry, proposed the establishment of a museum to preserve and portray the history of the logging and lumbering industries in Maine. As an “outdoor museum”, this proposal would create a unique and innovative way to educate people of all ages about Maine’s forest heritage. Eastern Maine had been built on logging and lumbering, and there was nothing to portray that part of our history other than a statue of Paul Bunyon in Bangor. During the next decade, volunteers collected artifacts, documents, tools, and stories to preserve which seemed doomed to be forgotten by generations removed from that logging and lumbering way of life. The next obvious conundrum arose in the form of a need for space. Where would these artifacts be housed? How would the be made available to the public? A unique plan was crafted to present a “living history site” to share authentic artifacts and portrayals of craftsmen, housing, and food that were part of a woodcutters life on the Maine frontier. A search for the appropriate spot for such an site eventually located “Leonard’s Mills”, as archaeologists had found evidence of five sawmills on Blackman Stream. During the late 1960’s, a total of 204 acres of the Penobscot Experimental Forest were deeded as a donation to MFLM by the following companies: Scott Paper Co., Great Northern Paper Co., International Paper Co., St. Regis Paper Co., Diamond International Corp., Boise Cascade Paper Group, Dead River Co., Prentiss & Carlisle Co., J.W. Sewall Co., J.M. Huber Corp., Seven Islands Land Co., J.D. Irving Ltd. Shortly thereafter, other lands were donated by Pierce Webber and Edmund Nolette. More recently, Beverly Spencer donated additional acreage. In total MFLM now owns more than 450 acres. Earl Spaulding – Dead River Co.
Ernest Rand – Oxford Paper Co.
Edwin Giddings – Penobscot Chemical Fibre Timberlands Mgr. The site of Leonard’s Mills in 1968 consisted of forestland, the remnants of a stone dam, and Blackman Stream. Visionaries created a few diagrams of this living history site, all focusing on a water-powered sawmill with a community of re-enactors harvesting timber, running the mill, making various wood products, living in camps, and period dwellings, as Maine’s early settlers would have done. History isn’t limited to one period, and Maine’s forest heritage continues into the present. Later development at Leonard’s Mills has preserved equipment, machinery, tools, photos, and documents into the 1900’s. A collection of chainsaws, a clapboard mill, Lombard Log-hauler, shingle mill, and rotary sawmill have all begun to come alive to portray life in the 1900’s, as it related to lumbering and wood products. 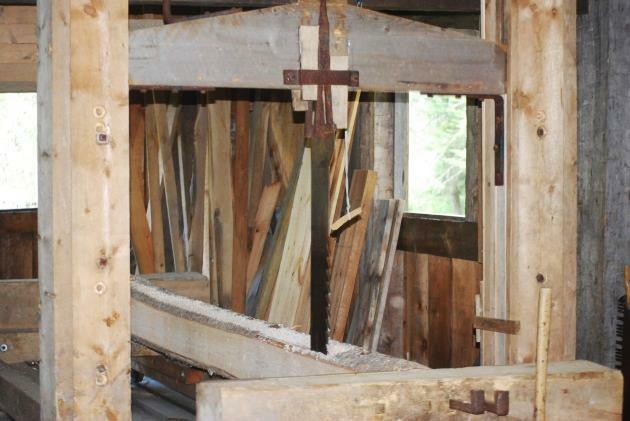 Maine Forest and Logging Museum, Inc.
Plans evolved to design a living history museum for presenting life in a lumbering settlement with mills, homes, blacksmith shop, etc. 2017: Wind storm in October brings down many trees, demolishing the trapper’s cabin and the gate house. The gift shop sustained minor damage. 2018: Many hours spent clearing debris from wind storm. 2018: Weeks spent processing the downed trees with a portable sawmill brought to museum. 2018: Tuesday crew constructed new privies by Visitors Center. 2018: University of Maine Construction Engineering Technology students put new roof on hovel. 2018: University of Maine Construction Engineering Technology students and Tuesday Crew built new privies by the caretaker’s house and the blacksmith shop.